The Breathe Right Nasal Strips relieve nasal congestion due to colds and allergies and reduce snoring. 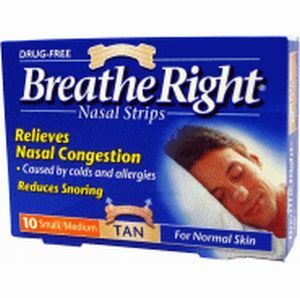 Breathe Right Nasal Strips are self-adhesive and fix on the outside of the nose to keep the nostrils open during sleep. Nasal dilation, as the process is called, is a well established treatment for those who snore because they suffer from nasal stuffiness. The Breathe Right Nasal Strips are available in sizes Regular (Small/Medium) and Large. The Breathe Right Nasal Strips are available in Original Tan and Clear. The Clear Nasal Strips have been designed for those with sensitive skin. Why not save and upgrade the Pack of 10 Breathe Right Nasal Strips to the Breathe Right Nasal Strips Pack of 30?